drycliftdays: A Drysdale bypass - a new heartbeat for the North Bellarine! A Drysdale bypass - a new heartbeat for the North Bellarine! As part of its campaign for a Drysdale bypass, the Drysdale & Clifton Springs Community Association (DCSCA) held a successful public meeting on May 2 at SpringDale Neighbourhood Centre. 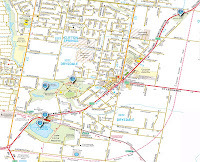 The proposed Drysdale bypass will, effectively, run between the Jetty Road roundabout and the Geelong-Portarlington Road at its junction with Whitcombes Road, but speakers at the meeting emphasised that far more people than just Drysdale residents will benefit from a Drysdale bypass. (Click on the map to enlarge it.) The population of the north Bellarine is set to increase enormously, yet no major roads are planned to accommodate the increased traffic. The resulting traffic congestion in Drysdale will lengthen people's travelling time from Portarlington, St. Leonards and Indented Head to Geelong and Melbourne; and it will also make the proposed Portarlington to Melbourne ferry a far less attractive option for commuters from Geelong. DCSCA is seeking support for the bypass campaign from community associations in other Bellarine towns and DCSCA President Doug Carson told the meeting that the St. Leonards Community Association has expressed its support already for the campaign. Vic Roads would be responsible for building the Drysdale bypass and the Victorian state government will be responsible for the bill! Vic Roads already owns about 50% of the land on which it would build the Drysdale bypass and it monitors traffic in Drysdale regularly. 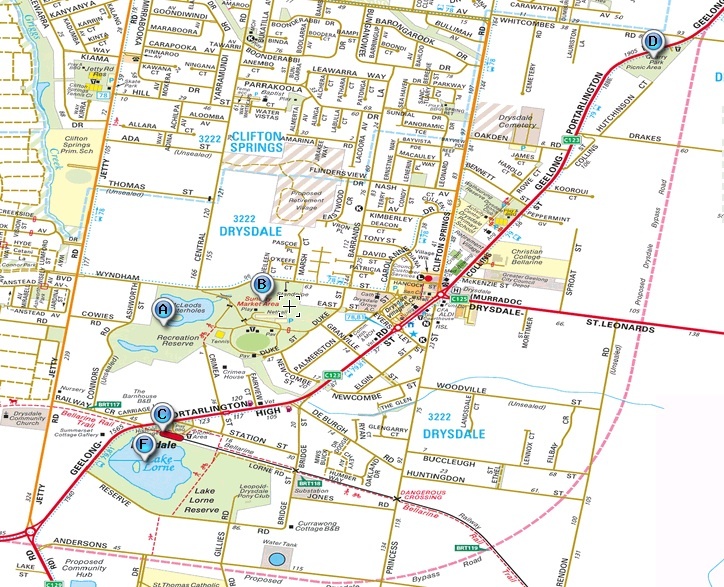 Vic Roads have stated that the traffic capacity of Drysdale High Street is 24,000 vehicles a day - at which point a bypass becomes a necessity in their view. In mid-2011, Vic Roads found that 18,000 vehicles a day use the High Street. In other words, a year ago, the traffic flow through Drysdale was 2/3 of the 'tipping point' for a bypass. Since then, the local population has increased, as it will continue to. The first of the 1,500 houses in Stage One of the Jetty Road Growth Area (just north of the Jetty Road roundabout) have started to appear; with more new houses to follow in the 300-lot Central Walk estate (just south of Murradoc Road). At this rate of population growth, if work on the bypass started today, it would probably be completed just as the population reached the Vic Roads 'tipping point' of 24,000 vehicles a day using Drysdale High Street. The current planned route of the bypass was drawn up before the massive increase in local population and some people at the meeting were concerned that the current route may pose traffic risks to local residents, to the schools off Andersons Road and to people attending the proposed sports/recreation precinct in Grubb Road. There was also concern about potential traffic noise and it was suggested that at least part of the bypass could be set into a cutting to reduce noise. Finally, there was agreement that rather than creating just a two-lane road suitable for trucks, Vic Roads should build a freeway-style bypass along the lines of the Geelong Ring Road. The meeting heard that a Drysdale bypass is part of a broader vision of economic development in the north Bellarine. At the heart of the vision is a new light industrial precinct in Murradoc Road, offering a diversity of business and employment opportunities. The proposed bypass will cross Murradoc Road at its eastern end near Clarendon Road, creating excellent road access into and out of the precinct. 1. Open up the area north of Murradoc Road for development by creating new access roads into it; and realign the roundabout at Murradoc's western end to make it less 'tight' for large trucks that currently risk tipping over. 3. Create tree-lined service roads on the north and south verges of Murradoc Road to offer delivery easier access. These service roads could also feature outdoor dining and performance spaces which, with imaginative lighting and shelters, would make the area much more attractive to pedestrians and effectively extend the centre of Drysdale eastwards.